What if I have mold? This looks icky to us, but the worms will eat this even though it is a citrus fruit! 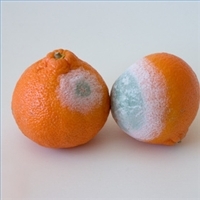 These moldy fruits look very nasty and if eaten could make you feel pretty nasty, too! Mold springs up in damp places like your basement, bathroom and even on your food. These spores are airborne and find that perfect, damp place to multiply. In the case of composting, they like to feed on the decaying food scraps. 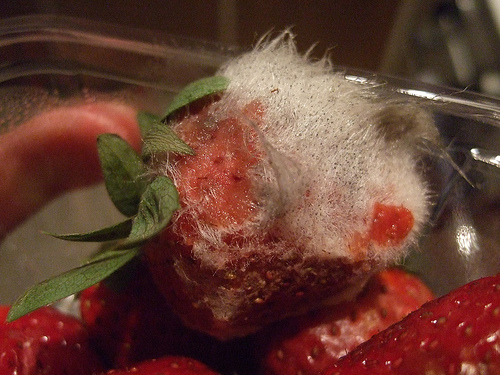 The strawberry and ortaniques above are infested with different forms of mold. When you find moldy fruits and veggies in your fridge or on your counter top, you can feed these to your Red Wigglers. Normally, I don’t feed my Red Wigglers copious amounts of citrus fruits. When the fruits develop mold, the wigglers with eat the fruit. The mold must change the chemical make up of the fruit…acidic to sweetic! lol… I have seen a lot of Red Wigglers all over lemons and oranges once the mold has set in! If you have mold developing in your bin (on the top layer of the composting food),there could be a few things going on in the bin…. 1) You could be feeding your worms too much and may need to back off until they have eaten what is left. In the meantime, freeze any scraps that you are producing. 2) Your bin could be to wet so add more shredded newspaper. 3) Bury the food so new air borne spores won’t attack the food. 4) Remove the moldy food if there is a nasty smell…..You’ll know…blah! There really isn’t a threat to they worms, but may bother people with mold allergies. Mold is another decomposer that is present in the decomposition cycle.